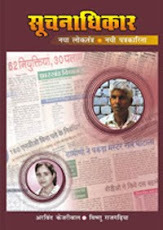 RANCHI: The Right to Information Act (RTI) can be used in different ways not only to expose corruption in government offices and public sector enterprises but also to force private NGOs and societies under Section 2(f) of the act to cough up information. Using the tool, noose can be tightened around those private agencies that try to fool people in the name of being associated with government-sponsored schemes. The option available in the act was utilized by oneVikas Sinha of Ranchi who applied for job in response to an advertisement published in a vernacular daily by Vikas Evam Kalyan Samity. Suspicious about the nature of the NGO, he filed an RTI application with the office of Ranchi deputy commissioner that resulted in a full fledged inquiry and exposure that the NGO was registered with Bihar government and had no association with Jharkhand. It still invited application for 455 posts under the so-called scheme, Jharkhand rural livelihood scheme, offering salary between Rs 6000 and Rs 12,000 for different posts. The application and inquiry constituted thereafter not only forced the NGO to pack up but the members involved were forced to return cost of application form (Rs 200 each) to all 200 applicants who had applied by the time the irregularity was exposed. 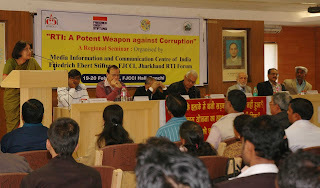 Sharing this incident at the two-day regional seminar organized by Media Information and Communication Centre of India (MICCI), Friedrich Ebert Stiftung (FES), Federation of Jharkhand Chamber of Commerce and Industries (FJand the Jharkhand RTI Forum here on Sunday, Sinha insisted to better understanding of the act and its proper use to drive out corruption and cheating. The seminar, "RTI: A potent weapon against corruption", aims at experience sharing and discussion on various ways of using provisions of the act in everyday life. Welcoming the delegates, Jharkhand RTI forum president Balram said that people have to understand and use the act because it still remains confined to the activist and has not been weapon of every ordinary man. "We are making efforts to explain to them the easy ways and applicability of the act besides sensitizing departments to come up for educating people about their rights," he said. FES India senior adviser Rameshwar Dayal said that the concept of RTI originated in Germany and given the success of the act it is now being used by citizens in 120 countries. RTI activistNandini Sahay who remained associated with the movement for legislating RTI since 1995 said that the form of act adopted in India is one among the best because it has penal provisions for the official delaying or denying information to the seeker. As director of MICCI, she has been associated with awareness drives and sharing success stories of the act. She also hailed Jharkhand RTI Forum's idea of felicitating the commoners who have made best use of the act in betterment of individual or society. 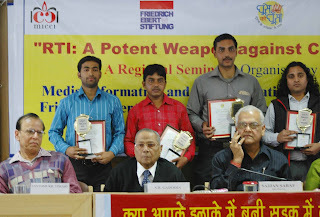 The platform was used to announce names of all 26 RTI champions who have been selected for the RTI-2012 awards. RANCHI - The effective and prudent use of Right to Information Act (RTI) can make the politicians and the Government accountable if it is used properly by the citizens, MICCI director Nandani Sahai said while addressing a two-day seminar at FJCCI. To review the practical implications of RTI for better governance and the use of the Act by the common people and media a regional seminar was organised on Sunday jointly by Media Information and Communication Centre of India (MCCI), Friedrich Ebert Stiftung (FES), Federation Jharkhand chamber of commerce (FJCCI), and Jharkhand RTI Forum. Discussions were carried on proper implication of RTI Act that would eradicate corruption from the society and bring transparency in the working of the Government. Near about 25 citizens were awarded with Lalit Bajla RTI award for successfully using this weapon bringing a drastic change in the system. The seminar was attended by Rajeshwar Dayal, senior advisor, FES-India, Prof Santosh Kumar Tiwari, central university, SB Gadodia, Ex-advocate general, Jharkhand, Sajjan Sarraf, president FJCCI, and session co-coordinator Vishnu Rajgadia. The main purpose of the seminar was to focus on the effective use of the act for good governance and to bring transparency in the working of the Government.